The way the people in Japan traditionally dress has been a topic of interest for a long time. With a different type of kimono for each occasion, be it formal or casual, the traditional attire of Japan is extremely fascinating. The Japanese kimono and the yukata are two of the most commonly worn garments in the country. Here is a compilation of the varied pieces and accessories that go with the kimono. A kimono is a full-length robe made of silk, worn by both men and women. While men have a simple black or brown-colored kimono, there are different designs of this for women. 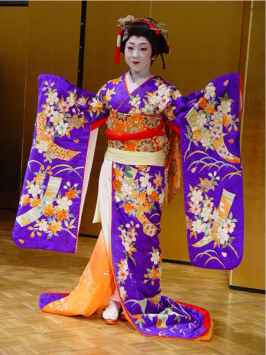 Traditionally, an unmarried woman wears a furisode (swinging sleeves) kimono, which has long sleeves (110 cm in length). Out of the 9 to 10 different styles of kimonos, a woman chooses one depending on various factors, such as her age and marital status, type and color of the garment used, its symbolism, and the sort of occasion. During winter, kimonos made of woolen fabric are worn more often. For funerals, a black kimono is worn by both sexes.